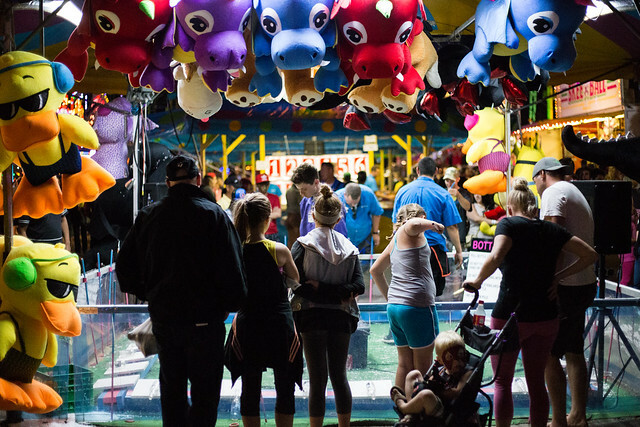 No summer in Edmonton is complete without a trip to K-Days to eat greasy food, take in the sights and sounds of the midway, enjoy some entertainment, and to stay up late for the fireworks. It’s something Sharon and I do every year, and this year we were fortunate to have our gate admission, food, and tickets to the TD Comfort Zone covered by Northlands. We visited on Saturday, and couldn’t have asked for better weather. This being the year of the Pokémon Go craze, the game was everywhere. 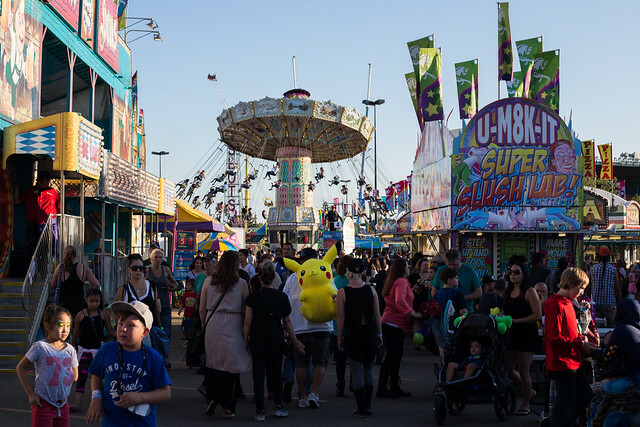 From the Pikachu and other plush characters being won at the midway games to the five PokéStops on site, good luck ignoring Pokémon if you attend K-Days this year. 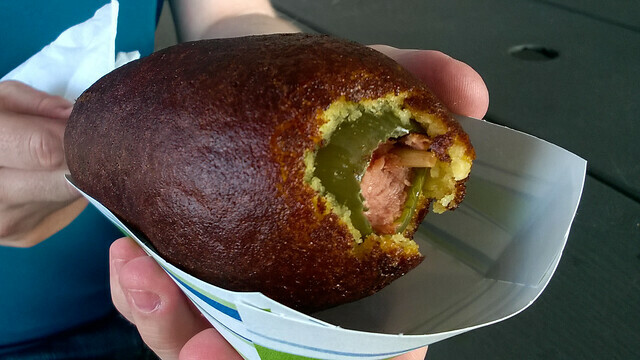 It turns out the first new food item we ate this year was the best! 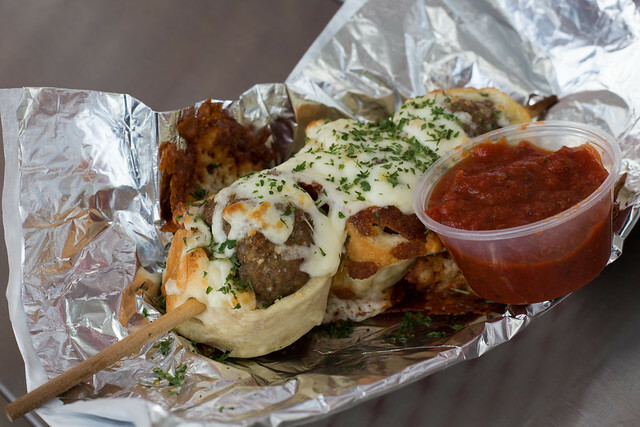 The Meatball Sub on a Stick from Pizza Casa actually won 1st Place in the New Food Contest and we can see why. It took a few minutes to make, but it had great flavor, wasn’t messy to eat, and actually didn’t feel all that unhealthy! I really liked that the meatballs were wrapped in dough, rather that in a bun that was awkardly skewered which is what I had imagined. The Teriyaki Chicken Perogies from International Perogies were on our list of new food items to try, but once we got there we were swayed by the Poutine Perogies. The $12 price seemed a bit steep, but the portion size was actually pretty generous. Have a bottle of water on hand when you eat this dish, because it was a bit salty, but it was very tasty. There are two things I always eat at K-Days: a corn dog and mini donuts. This year I tried the Bacon BBQ Corn Dog, which was pretty good and not much different than a plain corn dog with BBQ dipping sauce actually. I also tried the new Big Pickle Dog from Chicky’s Chicken. I really wanted to like it, but it was awful. The pickle was way too big and much too difficult to bite into. And in trying to bite into it, hot pickle juice flew everywhere. Worse, the hot dog itself was soggy and slid right out of the centre of the pickle. Just avoid it. Also on the avoid list was the Mac N’ Cheese Stuffed Burger from Gourmet Hand Made Stuffed Burgers. Aside from the highly questionable food safety practices of the vendor (even for K-Days) the dish just lacked flavor. Like the pickle dog, two things I love combined should have been amazing, but instead it was pretty disappointing. I wouldn’t say that we’re big midway gamers, but Sharon does love Bowler Roller (the 25 cent version). Though we spent a few dollars there, she actually won on her very first roll! Aside from Pokémon characters, emoji seemed to be the other hot prize this year. She won two of them. There was also fun to be had inside! We spent some time inside at TechLife where lots of people were playing video and board games. I’m tempted to go back on the weekend for the Canadian Drone Racing Championships! 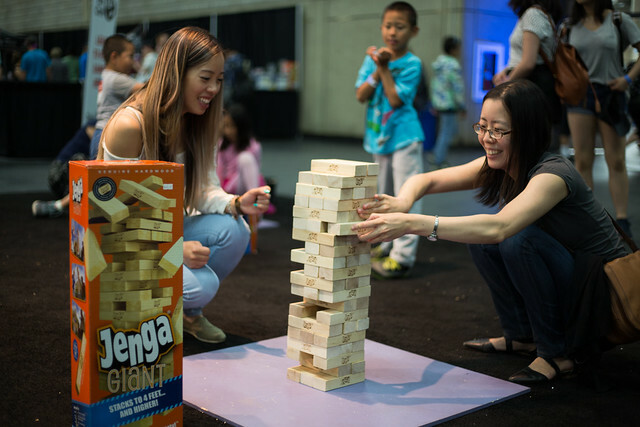 One of the more interactive features was the Jenga Giant games, which Felicia and Sharon played. They attracted a small crowd at one point because of the height they got to before it call came crashing down. 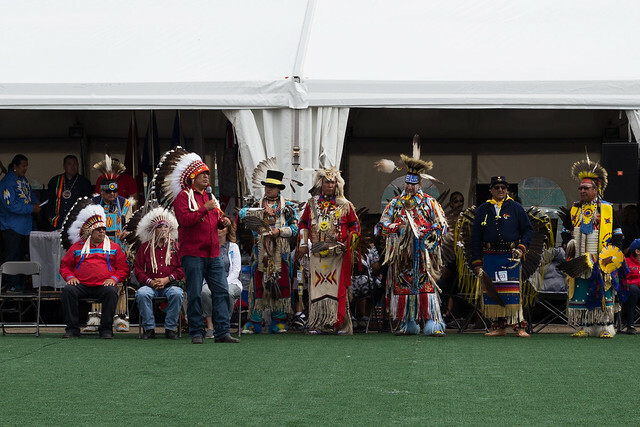 Back outside we visited the K-Days Pow Wow, produced in partnership with the Alexis Nakota Sioux Nation. The pavilion features a different theme each day of the festival and “will host members from First Nation communities within Treaty Six and across Canada.” Every day between 3:30pm and 8:00pm you can experience a variety of traditional songs and dances. If I’m being honest it felt a little like it was tacked on, but to be fair we didn’t spend a lot of time at the Pow Wow. I do think it’s important to recognize that K-Days takes place on Treaty Six land and I hope this aspect of the festival can be built upon in future years. In past years we have enjoyed the Super Dogs show inside the Expo Centre. This year, we watched the Peking Acrobats then went outside to take in The Canine Stars. I mean, who doesn’t love dogs doing amazing stunts? 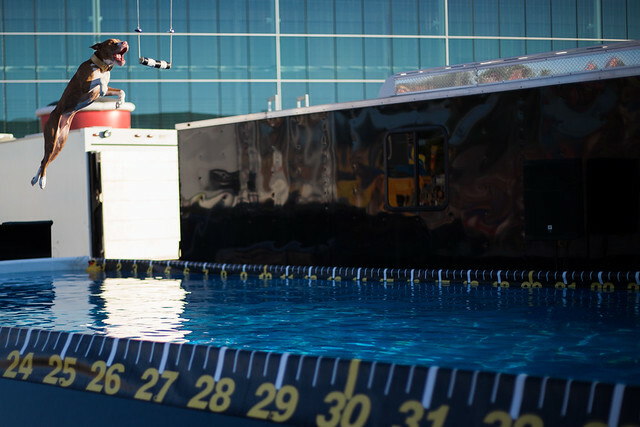 They caught frisbees, jumped over incredibly high hurdles, and dove into a giant pool, splashing everyone around it. It’s the kind of event the crowd really gets into! Entertainment, and specifically music, has been a focus for K-Days this year with great line-ups at both the North Stage and the South Stage. Shawn Hook, Rachel Platten, and Victoria Duffield are some of the artists you can hear at the North Stage, while major names like X Ambassadors, Moist, Tom Cochrane, Simple Plan, and Finger Eleven can be heard at the South Stage. On Saturday when we attended, I was thrilled that Matthew Good was performing! 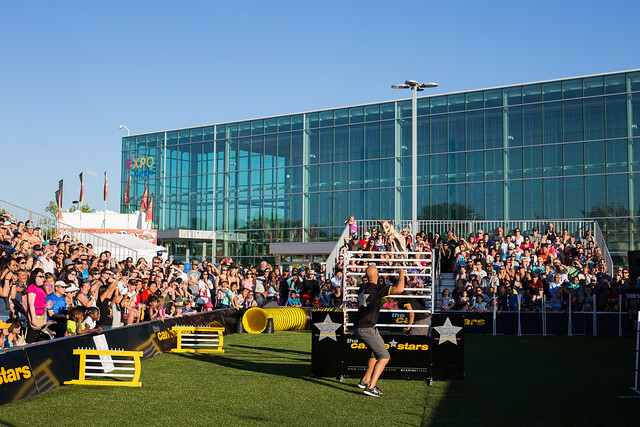 For the first time, the South Stage was moved from the concrete jungle alongside the rides to the track infield at Northlands Park. 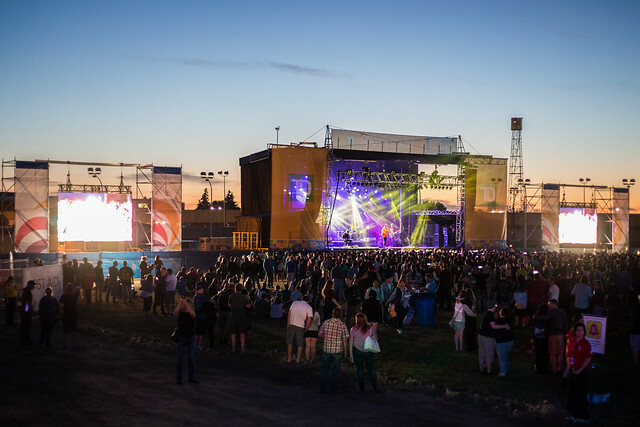 With a capacity of more than 12,000, the fully-licensed, grassy infield gave the stage much more of a music festival vibe. Just to the left of the stage was the TD Comfort Zone, a VIP area “designed for those superfans who truly want a night to remember.” It’s a large, covered, raised structure with appetizers, a cash bar, and a great view of both the stage and the crowds. Compared to the 5,000 or so people out in the infield, the VIP area was pretty empty, and we think most in attendance were invited by Northlands. Still, it did make for a comfortable way to take in the show if beach balls and mosh pits aren’t your thing. The other great thing about the new South Stage is that it offers an amazing view of the fireworks! We’ve always made our way over toward the casino for fireworks in the past, but this year we were able to get closer and could see the lights of the midway in the background. I definitely recommend checking it out, even if you aren’t particularly interested in the musical act that night. So far K-Days has had pretty good weather and with strong pre-sales thanks to the music line-up (I’ve heard twice as many pre-sales as last year), I think this could be an incredibly strong year for the festival. K-Days attendance peaked at 810,503 back in 2005. The festival was re-branded Capital EX the following year, and attendance plummeted to 688,369. 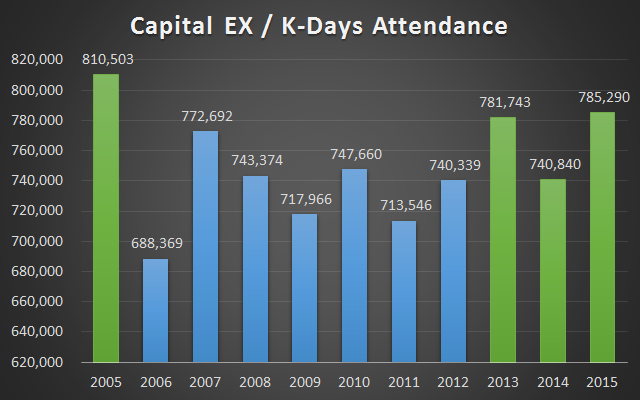 What’s most interesting is that the average attendance for the seven Capital EX years was 731,992. That’s only slightly below the average of 753,933 for the preceding seven years. But the branding damage was done, and the switch back to K-Days in 2013 was widely celebrated. So that was our experience this year! 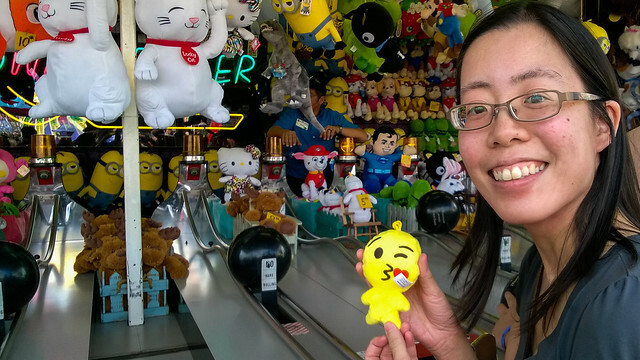 There’s a lot more to K-Days than we were able to take in, like rides, but we had lots of fun. Thanks to Northlands for the opportunity. 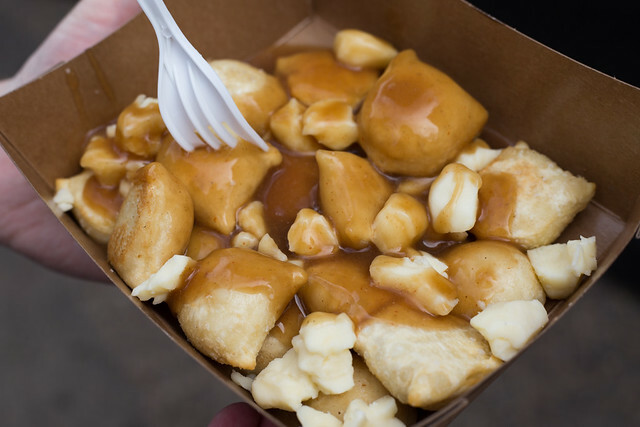 You’ve got until Sunday to visit K-Days for yourself! You can see more photos from our 2016 experience here. You can read about our 2014 experience here. Be sure to check out Linda & Mike’s experience this year too!